Photo (left to right): Katie Pullella and Alessia Colavecchia (Pran Sathiy / THE MIKE). 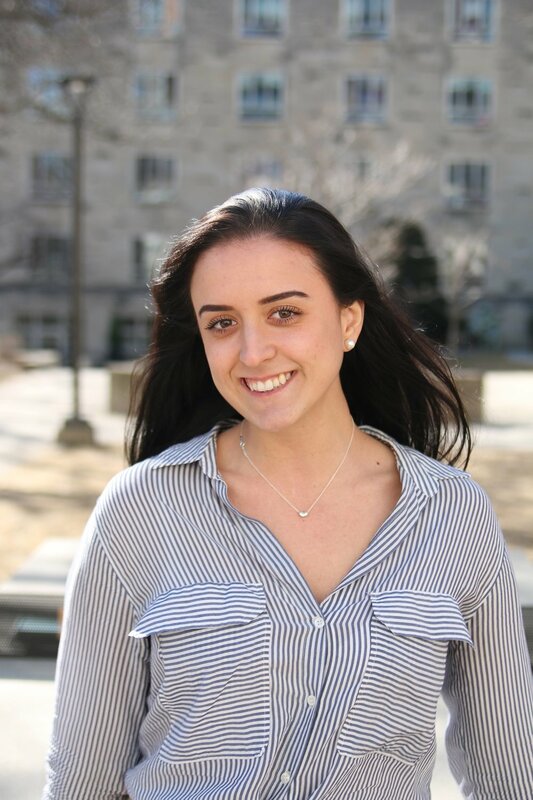 Katie Pullella is a fourth-year St. Mike's student in Health and Disease, and Alessia Colavecchia is a fourth-year St. Mike's student in Sociology and Religion. What do you like most about the University of St. Michael’s College (USMC) community and how did that affect you in terms of getting involved? Alessia (A): My favourite part of the USMC community is its unique capability of making people feel at home. Since my first year, I always returned to the USMC campus during my breaks, to eat lunch, or to hang out with friends. Aside from the fact that St. Mike’s is one of the larger colleges on campus, I always felt that “warm and welcoming” feeling. One of the benefits of attending a large college as such, is the diverse group of people that I’ve met over the past four years. Everyone has different talents, interests, and personalities and I truly have come to appreciate that everyone’s talent is what constitutes what a spectacular college this is. 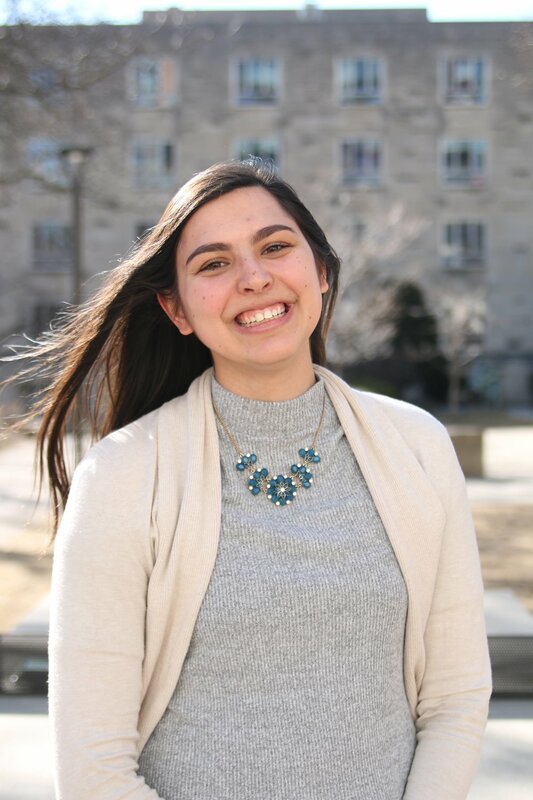 Katie (K): For me, I love the inviting and welcoming atmosphere at St. Mike’s. From the first moment I moved onto residence in my first year, I felt like I was a part of a larger community. That special feeling doesn’t leave, every time I’m on campus I get that same feeling, like I’m home. It’s the community itself that made me want to give back. I hope that my contributions help others get that same feeling of welcome, so they too can find comfort in “being home”. A: After graduation, I hope to attend the Ontario Institute for Studies Education (OISE) for the Master’s of Education program. I hope to have endless opportunities to travel and continue to experience the distinct cultures around the world. I am very passionate about education and the liberal arts and so I hope wherever my future takes me, I am somehow able to continue my contributions to this college for the future student experiences at St. Mike’s. Alessia (Pran Sathiy / THE MIKE). K: After graduation, I hope to continue my education at the University of Toronto (U of T) through working toward a Master’s of Science. I would also like to spend more time doing research. In my personal life, I would love to do a medical relief trip! What advice can you provide to individuals interested in becoming Orientation Coordinators (OCs)? A: My advice to anyone interested in taking on the role as an OC is to be welcoming, inviting, and don’t take the process too seriously but rather make sure to enjoy every moment. Something that my co-coordinator (Katie Pullella) and I really ensured we did this year was that we enjoyed this experience as much as we could and did not get overwhelmed or stressed out by the responsibilities that are associated with this role. As much fun as it should be for the incoming class and staff members of Orientation, it should also be an enjoyable experience for yourselves. Seeing your work pay off, and having the first-year students enjoy their first week on campus was one of the most rewarding experiences! K: My time as an OC (with my co-coordinator Alessia Colavecchia) was honestly one of the most memorable experiences I have had in my life. A piece of advice I would give the next OCs is to not stress the small stuff and enjoy the process. Planning Orientation provides a unique opportunity for personal growth and encourages everyone to step out of their comfort zone a little bit, embrace that. It’s also super important to have fun! Alessia and I made sure to enjoy what we were doing, from the logistics planning, to events during Orientation Week itself, which really makes the difference! The more you enjoy the process, the more rewarding it can be to see your hard work pay off. There is no better feeling than the day the first-years arrive and knowing that you will impact that initial community they feel when they step onto St. Mike’s! If you could tell your first-year self any piece of advice and wisdom, what might that be? A: My advice to my first-year self would be that you don’t always need to know what your next three steps are. It’s okay to not always have a plan and feel a sense of uncertainty. As long as you set goals for yourself (whether small or large), sometimes the greatest reward is in the spontaneity of how you achieve them, and many times in my experiences, that doesn’t come in having things planned out and in the know. K: If I could give my first-year self any piece of advice it would be to step out of your comfort zone earlier! My time at St. Mike’s has taught me that you learn the most about yourself when you do something new. Additionally, I would remind myself that everything happens for a reason and it is ok for things not to go according to plan sometimes. There is a beauty (and an art) to being comfortable with spontaneity! Katie (Pran Sathiy / THE MIKE). What, in your mind, has been your greatest accomplishment during your undergrad career? A: My greatest accomplishment in undergrad is not a physical or tangible one. My greatest reward is stepping out of my comfort zone and getting involved in roles and positions that I never would have imagined I could in high school. In doing so, I have learned an immense amount about the person I am, and what my interests and passions are going forward. K: I think my biggest accomplishment during my time as an undergrad is the growth that I have seen in who I am as a person. Getting involved taught me more about who I was and who I would like to be. I have been lucky enough to have had role models who inspired and challenged me. From the mentorship program to OC, my roles have taught me about what I value and will help better prepare me for the future. Mar 12 What is My Clothing Aesthetic?